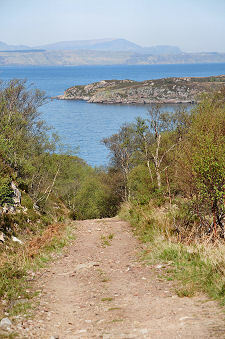 The single track road that runs much of the length of the island of Raasay is pretty marginal in places. A little beyond the point where it affords views across the Sound of Raasay into the mouth of Portree Harbour it heads across the spine of Raasay to the island's east shore, emerging above it close to the spectacular remains of Brochel Castle. 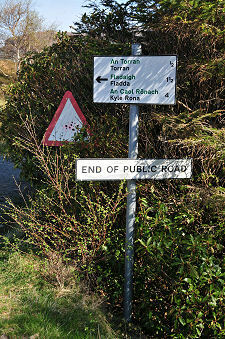 Until 1982, Brochel, still nearly five miles south of the northern tip of Raasay, was, literally, the end of the road. Yet until 1912, the crofting townships beyond Brochel were home to the bulk of the 400 or so people living on Raasay because of earlier clearance of the rest of the island. With mining development and resettlement the balance has since steadily shifted towards what you see today, where almost all the island's residents (161 in 2011, down from 194 a decade earlier) live in the south west of the island. Nonetheless, since 1982 the road north has extended for two miles beyond Brochel, largely thanks to the efforts of one man, Calum MacLeod. 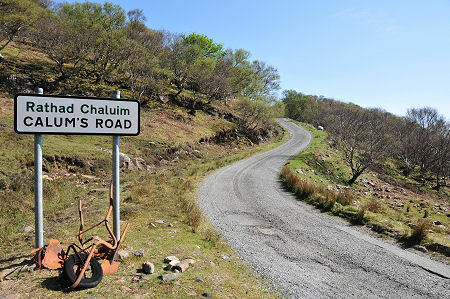 He almost single-handedly built what is now known as "Calum's Road" between the mid 1960s and the mid 1970s, at which point it was possible for Calum MacLeod to drive along it in his Land Rover: though he never drove south of Brochel as he never gained his driving licence. 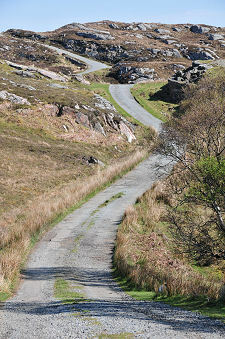 In 1982 the road was finally adopted by the council and finished off with tarmac, allowing it to be driven by the rest of us. Calum MacLeod's achievement is all the greater when you realise that he combined his road building activities with a job as a keeper in the lighthouse on Rona and with tending the crops and animals on his croft at Arnish. 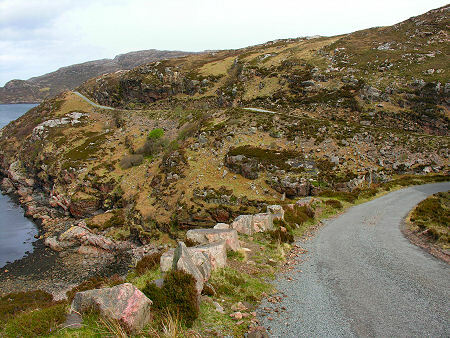 "Calum's Road" has entered the folklore of the Highlands and Islands as the classic example of the intelligent and well-read crofter taking on officialdom and, after decades of persistent effort, winning. He was commemorated in song by Capercaillie on their Album, "The Blood is Strong", produced in 1988 shortly after his death at the age of 77. More recently his story has reached a still wider audience thanks to Roger Hutchinson's bestselling 2006 book "Calum's Road". The story of Calum MacLeod is a compelling one. 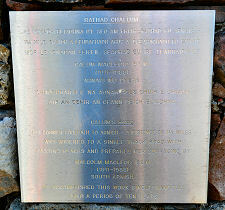 There is a plaque on a beautifully constructed cairn at one point alongside the road which notes that "This former footpath to Arnish - a distance of 1¾ miles - was widened to a single track road with passing places and prepared for surfacing by Malcolm MacLeod BEM... He accomplished this work single-handedly over a period of ten years." 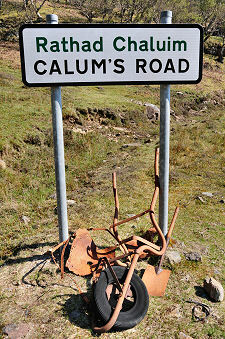 And there is a prominent sign marking the start of "Calum's Road" (see header image). But until you have driven it, it is impossible to have any understanding at all of the scale of what Calum MacLeod achieved. "1¾ miles" does not really sound very much. 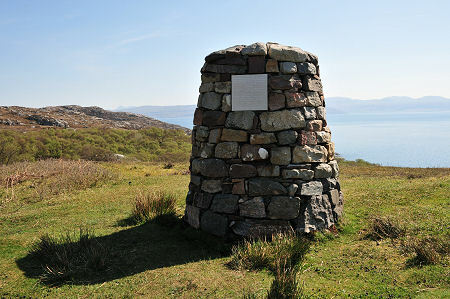 But the incredibly steep climbs and descents, the boggy moorland, and the need to skirt the cliffs above rocky inlets all combine to turn this into a truly epic piece of engineering: it is his road itself which stands as the best possible memorial to Calum MacLeod.